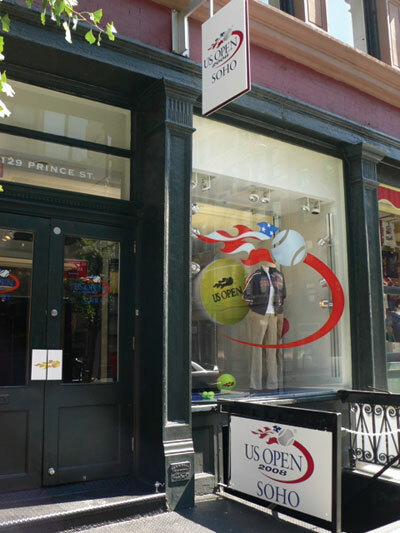 FLUSHING, NY — The USTA today announced that it has opened its first-ever pop-up store in New York City — US Open SoHo — offering US Open branded apparel officially licensed by the USTA. Through a multi-platform partnership with Team Retail Solutions, a leading event merchandise management company, US Open Soho will build awareness for the US Open and provide access to exclusive US Open merchandise for fans who cannot attend the event. US Open SoHo will be open from 10 a.m. to 7 p.m., seven days a week, beginning August 22 through September 10. The store will be located at 129 Prince Street, on the corner of Prince and Wooster, in New York City’s SoHo shopping district. One of the featured products at US Open SoHo will be the new US Open Breakpoint DVD board game which includes footage and images from some of the most memorable moments in US Open history. Additionally, the store will carry a vintage Tad Davis clothing line capturing the spirit of the 40th anniversary of the Open Era and co-branded US Open products by Under Armour. Heidi Klum, as part of the USTA’s wide-ranging green initiatives at the 2008 US Open, has designed a limited edition official US Open t-shirt that will also be sold at US Open SoHo. In conjunction with the store’s opening, two special appearances and autograph signings are scheduled featuring Hall of Fame tennis journalist Bud Collins on Sunday, August 24 at 5 p.m., and American tennis star Ashley Harkleroad on Tuesday, August 26 from 5:30 p.m. to 6:30 p.m. Other autograph signings will be announced throughout the week. The 2008 US Open, the world’s highest attended annual sporting event, is expected to attract over 700,000 fans with more than 250 of the world’s top tennis players from over 60 countries competing in the two-week event. The tournament will be held at the USTA Billie Jean King National Tennis Center in Flushing, N.Y., August 25 - September 7.